Your day-by-day itinerary now includes Dublin Castle, Grafton Street and Saint Patrick's Cathedral. 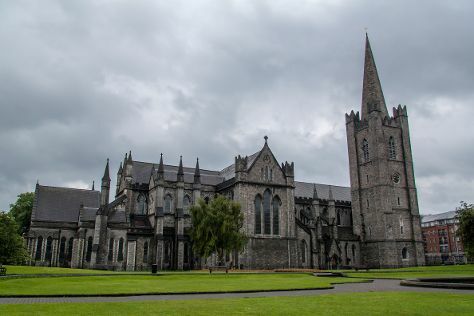 Here are some ideas for day two: contemplate the long history of Saint Patrick's Cathedral. To find maps, ratings, photos, and tourist information, read our Dublin route planner. Rochester, USA to Dublin is an approximately 13-hour flight. You can also do a combination of bus and flight; or do a combination of train and flight. The time zone changes from Eastern Standard Time to Greenwich Mean Time, which is usually a 5 hour difference. Expect somewhat warmer temperatures when traveling from Rochester in March; daily highs in Dublin reach 48°F and lows reach 35°F. On the 19th (Mon), you're off toKillarney. Your day-by-day itinerary now includes Blarney Castle & Gardens as well as Courtney's Bar. Get out of town with these interesting Killarney side-trips: Garinish Island (in Glengarriff) and Kenmare (Skyline Gallery & Gleninchaquin Park). There's lots more to do: shake up your sightseeing with a climbing tour, go for a charming ride with a horse-drawn carriage tour, hike along Torc Mountain Walk, and get outside with Ring of Kerry. To find other places to visit, where to stay, maps, and tourist information, read Killarney vacation builder . Traveling by train from Dublin to Killarney takes 3.5 hours. Alternatively, you can drive; or fly. March in Killarney sees daily highs of 51°F and lows of 40°F at night. Finish up your sightseeing early on the 22nd (Thu) so you can go by car to Galway. 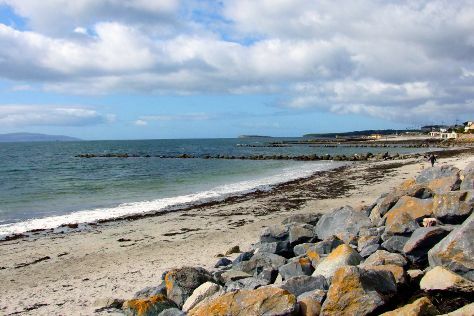 Your day-by-day itinerary now includes Quay Street as well as Salthill Beaches. Get out of town with these interesting Galway side-trips: Ballyvaughan (Burren Birds of Prey Centre, Aillwee Cave, & more), Westport (Westport House & Westport House & Pirate Adventure Park) and Kylemore Abbey & Victorian Walled Garden (in Kylemore). And it doesn't end there: steep yourself in history at Poulnabrone Dolmen, try to win big at Galway Greyhound Stadium, get to know the fascinating history of Kirwan's Lane, and explore the fascinating underground world of Doolin Cave. To see traveler tips, more things to do, reviews, and other tourist information, you can read our Galway tour planner . Drive from Killarney to Galway in 2.5 hours. Alternatively, you can take a bus; or take a bus. In March, daytime highs in Galway are 47°F, while nighttime lows are 36°F. Wrap up your sightseeing on the 25th (Sun) to allow time to travel to Glasgow. Explore Glasgow's surroundings by going to Doune Castle (in Doune), Falkirk (The Kelpies & The Helix & The Kelpies) and Blair Drummond Safari and Adventure Park (in Stirling). Next up on the itinerary: have fun and explore at Glasgow Science Centre, explore the different monuments and memorials at The Necropolis, test your team's savvy at Escape Glasgow, and stroll through Pollok Country Park. To see photos, other places to visit, more things to do, and tourist information, read Glasgow itinerary planner. You can do a combination of bus and flight from Galway to Glasgow in 7.5 hours. Alternatively, you can do a combination of bus and flight; or do a combination of car and ferry. In March, plan for daily highs up to 47°F, and evening lows to 35°F. Wrap up your sightseeing on the 28th (Wed) early enough to drive to Inverness. Change things up with these side-trips from Inverness: Rothiemurchus (in Aviemore), Loch Garten Nature Reserve (in Boat of Garten) and Highland Folk Museum (in Newtonmore). The adventure continues: get your game on at Wildwoodz, get a dose of the wild on a nature and wildlife tour, brush up on your knowledge of spirits at Tomatin Distillery Visitor Centre, and find something for the whole family at Landmark Forest Adventure Park. To see other places to visit, more things to do, and tourist information, go to the Inverness trip planner . Traveling by car from Glasgow to Inverness takes 3 hours. Alternatively, you can take a train; or take a bus. In March, plan for daily highs up to 47°F, and evening lows to 33°F. Finish your sightseeing early on the 31st (Sat) so you can drive to Edinburgh. Edinburgh is known for historic sites, museums, nightlife, nature, and parks. Your plan includes some of its best attractions: don't miss a visit to The Royal Mile, appreciate the history behind Scott Monument, admire the masterpieces at Scottish National Gallery, and sample the fine beverages at Edinburgh Gin Distillery. For traveler tips, other places to visit, ratings, and more tourist information, use the Edinburgh travel route tool . Traveling by car from Inverness to Edinburgh takes 3 hours. Alternatively, you can take a train; or take a bus. Expect a daytime high around 47°F in March, and nighttime lows around 34°F. Finish your sightseeing early on the 3rd (Tue) to allow enough time to travel to Manchester. Explore the numerous day-trip ideas around Manchester: Antony Gormley's Another Place (in Crosby), Trentham Gardens (in Trentham) and Liverpool (The Cavern Club, Museum of Liverpool, & more). There's lots more to do: examine the collection at National Coal Mining Museum for England, contemplate in the serene atmosphere at Chester Cathedral, identify plant and animal life at Trentham Monkey Forest, and admire all the interesting features of Old Trafford. To see reviews, other places to visit, and tourist information, go to the Manchester trip planning app . Getting from Edinburgh to Manchester by flight takes about 3.5 hours. Other options: take a train; or drive. Expect a daytime high around 55°F in April, and nighttime lows around 39°F. Finish your sightseeing early on the 6th (Fri) so you can drive to Bristol. Bristol is famous for its Georgian and Victorian architecture, street art, underground music, maritime history, and the world-famous Clifton Suspension Bridge. Change things up with these side-trips from Bristol: Stonehenge (in Amesbury), Gloucester (Gloucester Docks & Gloucester Cathedral) and Cotswold Wildlife Park & Gardens (in Burford). There's much more to do: get to know the fascinating history of Castle Combe Village, don't miss a visit to Glastonbury Tor, pause for some serene contemplation at St. Margaret's Chapel & Magdalene Almshouses, and contemplate in the serene atmosphere at Bristol Cathedral. To find maps, reviews, more things to do, and more tourist information, read our Bristol trip planning tool . Traveling by car from Manchester to Bristol takes 3 hours. Alternatively, you can take a train; or fly. Finish your sightseeing early on the 9th (Mon) to allow enough time to take a train to London. London is known for museums, nightlife, shopping, historic sites, and parks. Your plan includes some of its best attractions: take in the views from Tower Bridge, get engrossed in the history at Westminster Abbey, steep yourself in history at Houses of Parliament, and walk around St. James's Park. To see photos, maps, more things to do, and tourist information, read our London travel route planning tool . Getting from Bristol to London by train takes about 2 hours. Other options: drive; or take a bus. In April, plan for daily highs up to 56°F, and evening lows to 40°F. Finish your sightseeing early on the 12th (Thu) so you can travel back home.